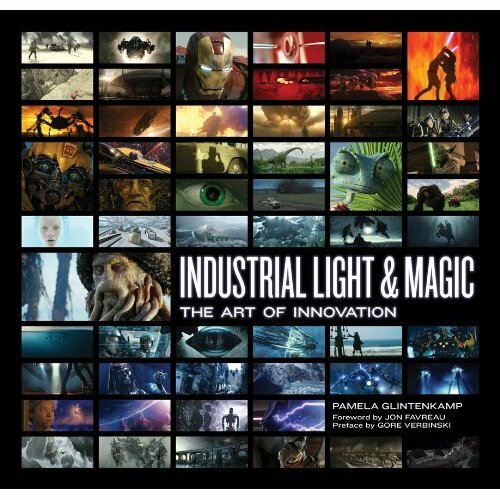 BOOK REVIEW #4: "PAMELA GLINTENKAMP'S INDUSTRIAL LIGHT & MAGIC: THE ART OF INNOVATION"
If you are a fan of visual effects especially people who paused their blu-ray on a frequent basis just to admire the small details (Transformers anyone?) or your wallet can’t afford every quarterly issue of Cinefex then this gorgeous coffee book table is the perfect gift for you. Consisting of 360 pages and over 400 images, “Industrial Light And Magic: The Art Of Innovation” recap the various major state-of-the-art innovations and achievements ILM Has accomplished from 1995 to 2011 starting with Casper and ending with Rango. Each title is given a minimal three to four pages of coverage and the interviews with the visual effects supervisors such as Dennis Muren, John Knoll, Ben Snow, Pablo Helman and Scott Farrar give readers an insight into creating the various complex digital effects. Over the years, the Academy-Award winning company has been tasked with creating CG characters for instance dinosaurs, Aliens in Men In Black and Mars Attack, forces of nature liked Twister, falling comet and venturing into space for the Star Wars prequels and Star Trek. But in this book, you get to learn further. For example, the four hundred vfx shots for Jarhead are termed as invisible to the audience because its mere smoke, fire and miniature TWA airplanes and that also applies to Steven Spielberg’s Saving Private Ryan. How about the challenge of creating believable CG water wave using fluid dynamics technology in Poseidon? Or creating a fully CG Davy Jones in Pirates of the Caribbean: Dead Man’s Chest? And you wouldn’t know that Robert Downey Jr isn’t wearing any physical suit except a maroon pajama for Iron Man? To be frank, the book tends to give the spotlight on major blockbuster hits even though at times ILM is only engaged to be one of the many vendors providing visual effects for the title. Movies liked Titanic, Harry Potter and the Half-Blood Prince and Avatar although controversially, ILM is the one who did the initial test reel for James Cameron to convince Fox to green-lit the project. The book also fails to mention the opening of ILM Singapore consider they did highlight the moving of ILM to a new facility in the heart of San Francisco. Far more interesting, there’s couple of personal accounts of how the various staffers came to work at the famous company. Not to be taken as an in-depth discussion into the technologies of computer effects, author Pamela Glintenkamp’s “Industrial Light And Magic: The Art Of Innovation” is the latest in the trilogy of books about ILM that pays tributes to the true invisible, hardworking people behind a craft so heavily used in contemporary movies. It is a genuinely good read filled with plenty of behind-the-scenes graphics despite the stated flaws.